Sulfur + pHwater + C1000 Multi Pack! Our Pure Organic Sulfur Crystals is the best example of MSM (methylsulfonylmethane) available. Sulfur plays an important part in tissue breathing, the process whereby oxygen and other substances are used to build cells and release energy and has a vital relationship with protein. Organic Sulfur is a remarkable mineral for Arthritis, Osteoarthritis and Cardiovascular health. Organic sulfur is a food, not a drug. Vitamin C-1000mg Complex also provides 500 mg of Citrus Bioflavonoids; Hesperidin, Rutin, Quercetin and Acerola. All of which offer benefits to circulatory health. Acid...The Enemy Keeping You from Good Health! Finally, a way to remove the acidity from your body. pHenomenal Water has the ability to grab those acid molecules and drag them out of your body once and for all. It’s derived from pure water with only a little calcium added as a stabilizer and to help it taste so smooth & refreshing. Plus, phenomenal water is 100% American made. Cardiovascular Health / Energy Multi Pack! 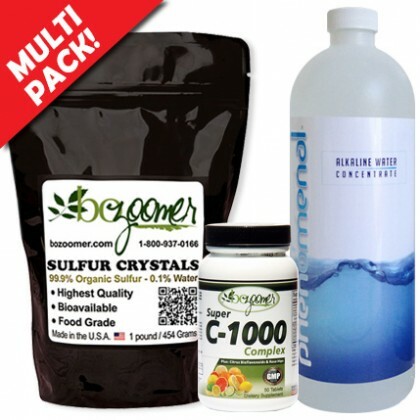 Our Pure Organic Sulfur Crystals USA produced - is the best example of MSM (methylsulfonylmethane) available. Sulfur plays an important part in tissue breathing, the process whereby oxygen and other substances are used to build cells and release energy and has a vital relationship with protein. Organic Sulfur is a remarkable mineral for Arthritis, Osteoarthritis and Cardiovascular health. Organic sulfur is a food, not a drug. CoQ10-Ubiquinol If you are concerned about your heart health … if you suffer from fatigue, muscle aches, or memory issues… then this is going to be big news for you. You probably know that CoQ10 plays a pivotal role in your health. CoQ10 is the "spark plug" that ignites energy production in every one of your 50 trillion cells. 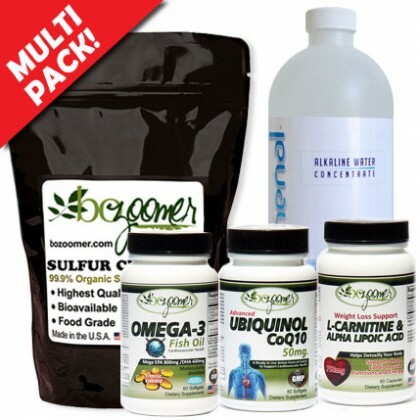 CoQ10 is also one of the most powerful antioxidants in your body. As you age your ability to naturally convert to Ubiquinol is less and less. You need Ubiquinol. Omega-3 fatty acids are considered essential fatty acids. We need them for our bodies to work normally because essential fatty acids are not made in the body. Fish oil supplements can also cut elevated triglyceride levels and may lower the overall risk of death from heart disease. Fish oil supplements [EPA+DHA] significantly reduced stiffness and joint pain associated with Rheumatoid Arthritis. Omega-3 supplements also seem to boost the effectiveness of reducing inflammation. Our Omega-3 Fish Oil is Enteric Coated - a process which allows the capsules to pass undissolved through the stomach into the intestinal tract where they breakdown. This eliminates the fishy aftertaste that is sometimes an issue with uncoated capsules. Sign Up for our Newsletter for 10% off NOW!